Black Widow spiders love hanging around in skimmers and under the Kool decking at the top of the tile. There are lots of bugs to feed on. This is a good reason to brush your tile each week, removing any spider webs around the pool. Remove webs around the pool equipment and skimmer using thick gloves. Wolf spiders like hanging out in the skimmers and hiding under the Kool decking too. 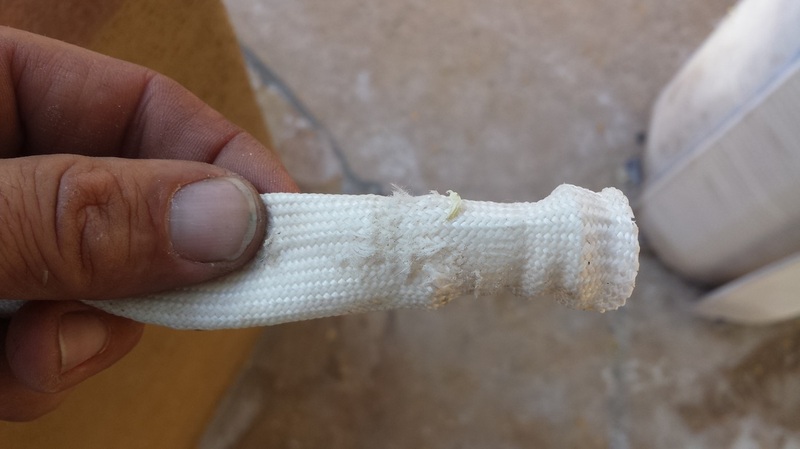 Again, always use your brush, or gloves to remove any webs. Even scorpions can be found in cracks, inside the skimmer and around the tile of the pool. Sealing the cracks with calk around the tile and rock features will take their refuge away.However, the best way to eliminate predator insects around your pool, is to keep the yard clean. Tall grass, untrimmed palm trees, leaves and rotting fruit from citrus trees lying on the ground attract insects, which in turn attracts predators who feed on them. Typically, it takes 75 minutes to raise the temperature of 1000 gallons of water 30 degrees with a 250,000 BTU gas heater. The amount of gas you use will depend on the temperature of the water to start with and how warm you want to make it. The colder the water is, the more time and fuel it will take to raise the temperature to 100+ degrees. Lets say for example you have a 1000 gallon spa and a 250,000 BTU gas heater. During the month of January, the water temperature is often 65 degrees here in the valley. When I use a spa, I like to heat the water to 103 degrees. This is an increase in temperature of 38 degrees, which will take about an hour and a half. Now on the other hand, if it were July and the starting water temperature is 80 degrees, it would only take about 45 minutes to go up 23 degrees, requiring a lot less fuel. An 11K electric heater will raise the temperature approximately 5 degrees an hour in a 1000 gallon spa. Under the same conditions mentioned above, it will take about 8 hours to bring the 65 degree water to 103 degrees and 4.5 hours to raise the temperature from 80 degrees to 103 degrees. I cannot stress this enough…if you have a heater, you must pay attention to the water chemistry weekly through out the year. You want to make sure you are keeping your pH between 7.2 and 7.6. Scaling will form on the heat exchangers when the pH is allowed to get high, over 7.6. When the pH is left to drop below 7.2, the water is more acidic, which can also damage heat exchangers as a result of corrosion. Corrosion can also happen through oxidization, so you want to avoid putting chlorine tabs in the skimmer when you own a heater. Damaged heat exchangers due to poorly maintained water, or neglect, will void the manufactures warranty on new products. It is always a good idea to keep your yard clean when you have a pool. Dead leaves, flowers and loose trash [like styrofoam and plastic bags] lying on the ground will get into the pool when the wind kicks up. 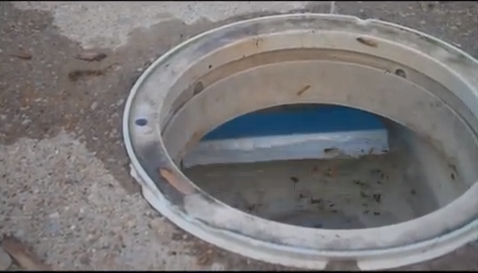 Debris like this will clog baskets and suction side cleaners, effectively stopping your pools ability to circulate water and keep itself clean. All debris when there is enough of it can cause problems, but flowers, like those from the Bogenvia bush, a lilac, or trumpet flowers for example, are like paper pulp when wet. Keeping Bogenvia bushes from getting too big will help a lot to control debris when it flowers. A small amount of these flowers can line a basket, clog the holes and effect water circulation. One plastic bag from a grocery store, or a sheet of newspaper can cause a loss of water circulation and shut a suction side cleaner down.Even if your yard is spotless, remember that your pools cleaning system can easily be effected by a neighbours tree, or a city tree adjacent to your property. You should always check the baskets after a storm if you are able, even if you pay for pool service. I visit my accounts once per week and a lot can happen in just a few hours when a wind storm comes through. Trimming trees like Palms for example when they have dead fronds hanging and seed pods dropping onto the ground should be trimmed back.A pump basket splitting open will allow debris to get past the basket and into the pumps impeller. When this happens, water circulation will be greatly effected and the system will lose filter pressure. Floor head systems will not have the pressure required for the pop ups to function and suction side cleaners, if not clogged themselves, will not have the water circulation required to keep them moving. Sometimes a pumps impeller can be cleaned once the basket has been removed, but, depending on the pump, the motor may have to be taken off to access the impeller. Inside of your skimmer, there is a plastic gate called the weir. The weir is a very small part that makes a very big difference in how clean your pool looks through out the week. 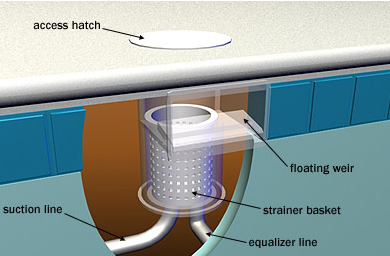 Its amazing how often I see the skimmer missing its weir gate and how many people, including pool technicians who clean pools every week, that don’t know what it is, or what it does. DE filters and cartridge filters must be taken apart and cleaned at least once every year. Depending on the amount of dirt, debris, or dog hair that gets into your system, it may be necessary to clean a filter 3-4 times a year. You can back wash a DE filter, but residual build up of dirt, DE and debris, gets compacted between the grids and sits on the manifold. The tear down must happen in addition to back washing through out the year. Doing this maintenance can save you from unwanted problems and it can help save you money. Manifolds, air breather screens, cartridges and DE grids will last longer if they are kept clean and not allowed to get ‘caked up’ with debris. If dirt and debris builds up too long and becomes compacted, it reduces water flow, basically acting like a cork. Floor heads may not ‘pop up’, or no longer have enough pressure to move dirt and debris toward the drain. Suction cleaners will not have the water flow required to move properly. Compacted dirt and debris can ruin cartridges prematurely and the weight of the residual DE in a DE filter, can cause the grids to collapse, breaking the skeletal plastic inside, or crack the manifold. There are manyy products available to get rid of algae. 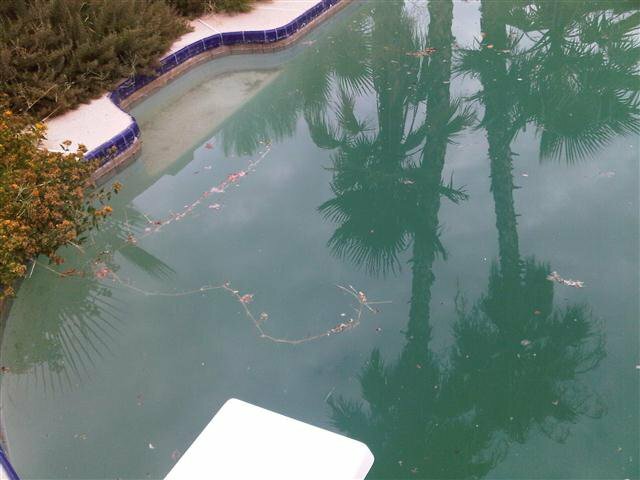 Phosphate removers and sometimes a specific algae control solution is required, depending on what type of algae is growing in the pool. 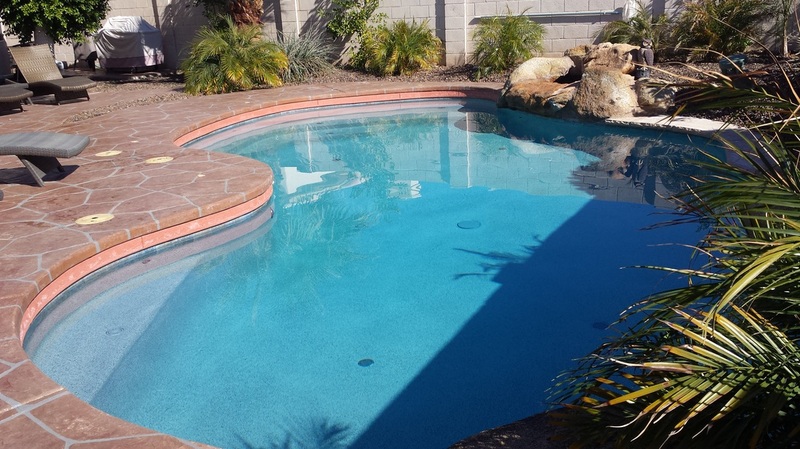 Did you know that adding too much copper based algaecide can stain your pool plaster? Copper metal stains are purple in color and require special stain removers, and an acid wash to remove them. In more extreme cases, even after using 1/2 a can of WD40, or Liquid Wrench, I still could not get the seized bolt out of the pump pictured to the right. 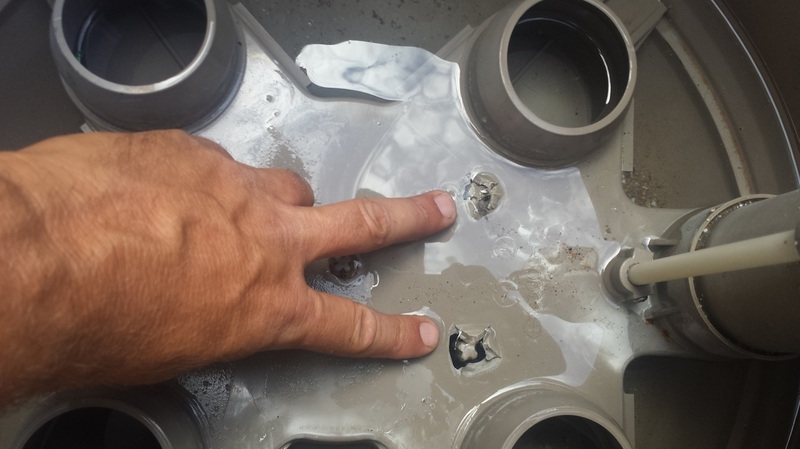 The threaded brass insert, which is moulded into the pump itself and is how the motor/seal plate attaches to the pump, popped out attempting to free the corroded bolt. This cannot be repaired.In the case of this old Hayward Super II pump, the brass inserts are in the pump itself, not a seal plate that can be replaced like the Pentair Whisper flow pumps. 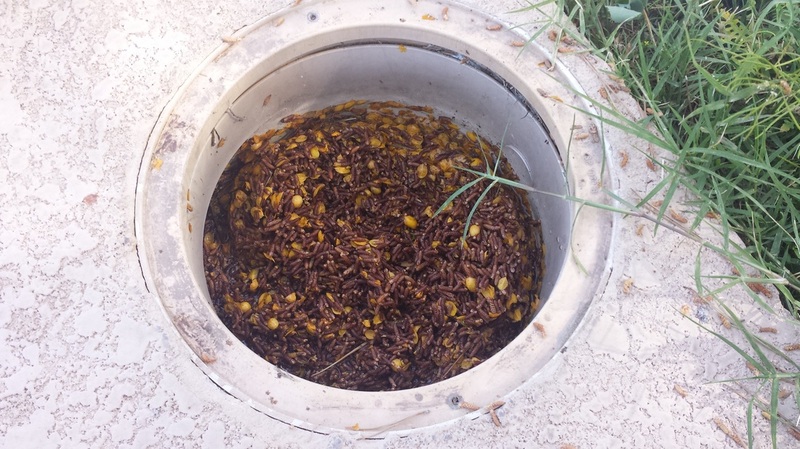 With Title 44 being the law of the land here in Arizona, this neglected shaft seal will end up costing the individual about $1000, or more, with the installation of a new, two speed pump and digital time clock, capable of running the two speeds, or a variable speed pump. I’m often asked if I provide bi-weekly service, or if I come less in the winter for a lower rate and my answer is always no. When you have been around pools as long as I have, you know better. Arizona Monsoon season is July-September. However, wind storms and rain storms are not limited to these months alone. In the example illustrated on the left, there were city owned trees next to the property on the other side of a retaining wall. I had to take a picture of the amount of plant debris I pulled out of the strainer basket, because it was as full as it could possible be after a storm…in January. Bottom line? It’s important to keep checking on your pools equipment and the water chemistry consistently through out the year. Reduce unwanted problems and damage to the pool and pool equipment, by dedicating 15-30 minutes each week. It is never a good idea to neglect your investment over the winter months simply because its too cold to swim. NEW! Swimming pool pumps added to the Appliances and Equipment energy standard of Arizona. What is Title 44?Arizona Legislature recently passed Title 44 and included it into the Appliance and Equipment Energy-Efficiency Standards of the Arizona Revised Statutes. Within Title 44, there are new efficiency standards for residential pool pumps, pool pump motors and portable electric spas, which went into effect on January 1, 2012. The law applies to pump/motors that circulate and filter water for the swimming pool. Stand alone water feature pumps and stand alone pumps running floor head cleaning systems are exempt. What does this mean for pool owners? While it does not affect any pump currently installed on an in-ground residential pool, any newly installed pump that is 1 horsepower or greater must have at least a two speed motor, or a variable speed motor. In the case of a motor replacement by itself, if the existing pump is still in good shape, there are options for two speed motors available, which will save you money by not having to replace the whole pump. If the motor has its own digital controller, which the one I install does, you would not need to purchase a new time clock that can control a second speed. The majority of multi-speed motors are made the conventional way, and only offer a high and low speed.Many companies now offer a pump with a two speed motor, which requires a new digital time clock to be installed, that can control two speeds. However, the savings really come when you upgrade to a variable speed motor [available with variable speed pumps]. The variable speed motors are brushless motors, that use magnetism to spin the shaft and can be set to run at speeds between 600 RPM and 3450 RPM. Variable speed settings give you the flexibility to choose a high and low speed that is appropriate specifically for your size pool, and the type of cleaning system that you have, maximizing energy savings.Two speed motors and pumps are the minimum standard to be in compliance with the Title 44 law, but for the greatest efficiency and a longer warranty [3 years on a variable speed pump], it is highly recommend that you upgrade to a variable-speed pump. Variable speed pumps are much quieter and give pool owners greater flexibility, all while using up to 80% less energy than a conventional single-speed pump when properly calibrated. The payback time is usually less than two years for the difference you pay up front, between the variable speed pumps and the two speed pumps with a new two speed time clock installed. How can I save money and energy by upgrading my pool pump? Variable-speed pool pumps have the ability to operate at a variety of speeds. 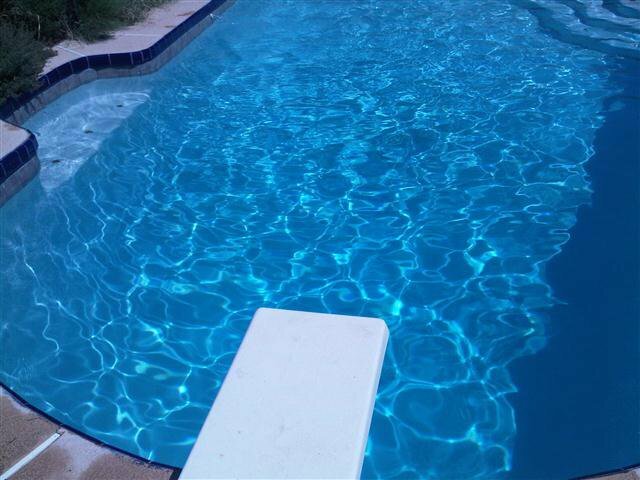 I will determine the volume of water in your pool and the amount of water that must be filtered each day. The pump can be set to run at very low speeds, appropriate for your pool specifically, which in turn will conserve energy. Higher speeds can be used for shorter periods of time to run floor heads and bottom cleaners. By filtering the water slowly, over a longer period of time per day, you can save well over 30% on your current monthly pool electricity cost. Why does slowing down the water save on pumping costs? When using the low-speed mode of a variable-speed pump, the water moves slower and thereby reduces the friction in the system. Reduced friction decreases the back pressure and as a result, the pumps motor does not work as hard, which means less energy is used. With less friction and back pressure, it takes only a small amount of energy to keep the water moving through the pipes after the pump has been started.